Nutritional supplement for horses and ponies specially formulated for minimising reactions to stress. Reduces the effects of stress caused by transport, competition etc. By means of its composition of Passionflower, Lime, Verbena, Jasmine, Schisandra known for their de-stressing and calming virtues, Calm Paste enables horses to regain all their capacities and faculties during an unusual or disturbing event. Calm Paste is formulated to combat stress, but it also has an action on digestion (Verbena), on sensitive nerves (Jasmine), on male excitement (Hops) and on nervous spasms (Jasmine, Passionflower, Lime and Verbena). 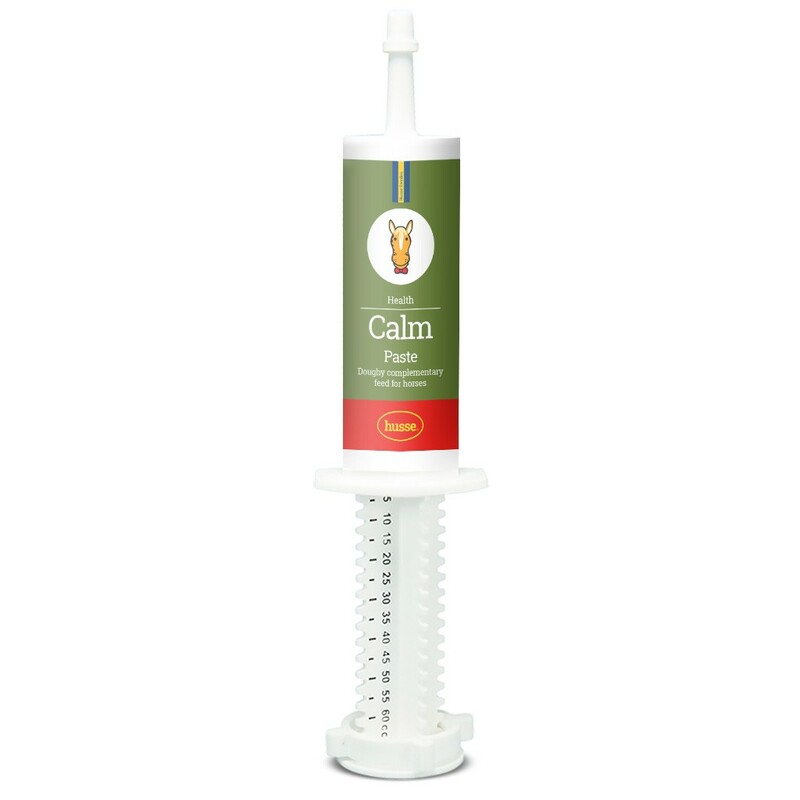 Furthermore, Calm Paste enables horses to regain their normal state: increase in available energy and resistance against physical effort (Schisandra), sleep (Passionflower, Lime and Verbena). Tryptophan is an amino acid that completes Calm Paste with its action on stress related ulcers. To be given the day before the stressful event, and on the day of the event. Thanks to its dispenser, Calm Paste takes up little space. It can be taken everywhere and be given directly in the horse’s mouth whenever and wherever. Can be administered more than once in a day, max.4 injectors per day. For stallions in reproduction suspend dosage 2 days before mating. Horses and large ponies: 30 ml. Ponies and young horses: 15 ml. water, extracts of plants and fruits (passionflower, lime, verbena, jasmine, schisandra), magnesium chloride 500 mg, amino acid (Tryptophan) 1000 mg, flavouring, structuring agent.